That's the question people keep asking those of us who keep an eye on the polls. You remember 1994: Newt Gingrich, the Contract with America, the Republican Revolution. That was the last time angry voters rose up and overthrew the majority party in Congress. Then, it was the Democrats who lost. Now, it's the Republicans in peril. The answer is that it sure looks a lot like 1994 in the polls. The latest Associated Press-Ipsos poll shows Congress with a 25 percent job-approval rating. That's the lowest rating for Congress since -- gulp -- 1994. Even though President Bush is not on the ballot this fall, midterm elections typically are strongly influenced by a president's popularity -- or unpopularity, in the case of President Clinton in 1994. Clinton's job rating at this time in 1994? Forty-eight percent. President Bush's latest job rating? Thirty-three percent. Double gulp. Democrats need a net gain of six Senate seats and 15 House seats to retake control of Congress. It's hard to see that happening if you look at the Senate and House races one by one. But national polls suggest a rising tide of voter anger captured by the ancient political maxim, "Throw the bums out!" And a majority of incumbents -- that is to say, the "bums" -- happen to be Republicans this time around. What are people angry about? Congress can't pass immigration reform. It can't pass a budget. It can't even control its own spending. Ethics? Don't get us started: Lobbyist Jack Abramoff and Rep. Randy "Duke" Cunningham have pled guilty to various offences; Rep. Tom DeLay faces charges; and now Rep. William Jefferson, a Democrat, is under investigation. Can Congress do something about gas prices? Why, yes. The Senate Republican leadership proposed a $100 rebate for all Americans. That proposal got laughed off the agenda. It has become this year's symbol of an out-of-touch Congress, just as the Terri Schiavo case was last year. Republicans console themselves by repeating the mantra, "All politics is local." Which is true, except when it's not true. It was not true in 1994. And maybe not this year, either. I was working on a story in my office this past Wednesday when I received a call from U.S. Secretary of Commerce Carlos Gutierrez. I've been doing a lot of stories on immigration of late, and I thought that since the secretary is a Hispanic immigrant like me, that's what he wanted to talk about. Instead, we began chatting in English, Spanish and Spanglish about another pressing story. He told me about a trade mission he's undertaking. That's where U.S. business leaders travel abroad to an emerging market to look for investment opportunities, not exactly the type of story I would be interested in, because it fits neatly into the "so what" category. When I, just to be polite, asked what country, his answer both intrigued and astonished me. "New Orleans?" I threw back at him. "How's that?" He told me that never before has a U.S. trade delegation gone on a trade mission inside the United States, but if ever there's been a place in the United States that needed it, it's New Orleans. Here's his explanation: Our government has spent tens of billions of dollars in the area, much of it misspent, and New Orleans still needs a lot of help. Secretary Gutierrez, who quit his job as chief executive officer and chairman of the board of Kellogg to work for the government, and took a huge cut in pay to do so, is a big believer in private sector initiatives. And he's convinced that "big business has a better shot at saving New Orleans than big government." That's why he's on a bus, traveling throughout the Gulf Coast. On board with him are executives from 32 of the most powerful corporations in the world, including Citigroup, Caterpillar, Marriott, Goldman Sachs, Shell, Home Depot, Dow Chemical, Disney and Wal-Mart, just to name a few. On "360," we will take you along for the ride. Did immigration rallies spur backlash? For Phil Jones of Herndon, Virginia, the backlash against illegal immigration began last year when he took his teenage daughter to a convenience store near his home. He says his car was mobbed by illegal immigrants looking for work as day laborers. He says they completely surrounded him and tried to climb into his car, and that when he indicated he was not hiring, they made obscene gestures at his daughter. So when Jones heard that his town council in Herndon was going to establish a permanent hiring center for immigrants, including illegal immigrants, he began organizing opposition. And it worked. On Tuesday, just one day after nationwide rallies against stricter immigration laws, Herndon voters tossed out the officials who supported the hiring center. Across the nation, grassroots groups favoring stronger immigration controls and enforcement say they are benefiting from a backlash against illegal immigration after the pro-immigrant rallies earlier this week. They say e-mails, phone calls, and even donations are on the rise, as legal American residents react to the demands that illegal immigrants be given amnesty and allowed to become citizens. Since Jones began his campaign for tougher immigration policies, he says, his home has been egged and a pro-immigrant Web site posted his picture online, calling him a racist. But Jones is not giving up the fight. He is convinced the immigrant rallies this week made many more Americans aware of what he sees as growing militancy among people who don't even have a right to be here. He thinks the backlash has just begun. What do you think? There is no question it is difficult to get people to pay attention to a "bird virus" that primarily exists on the other side of the world. Add in the fact that we can't say for sure whether this H5N1 virus will turn into a contagious human virus, and eyeballs tend to glaze over at its mere mention. So, many people were probably surprised when the White House released a significant plan today to deal with a worst-case outbreak of the bird flu, where 2 million people might die, 50 million people might be infected and 40 percent of the workforce could be out of commission. The plan's price-tag: $7.1 billion. This much is clear: We are not ready to handle the toll of a pandemic flu if it were to hit the United States tomorrow. Hospitals barely have enough intensive care beds and ventilators to care for the sick today, and if we suddenly had an additional 10 to 20 million critically ill people, hospital resources would be overwhelmed. But from my reading of the White House plan, it looks like little of the $7.1 billion will go to expanding hospitals or other health centers. Most will be spent on stockpiling Tamiflu (an antiviral medication) and the production of vaccines, which would need to be changed if and when the virus mutates. There are also plenty of recommendations for communities and states as to how they should begin programs of surveillance and preparation. But those recommendations aren't complete. For example, if someone arrives in Boston from Bangkok and is ill with flu-like symptoms, what would we do? Will there be an enforceable quarantine? Frankly, I am not sure how that will work in reality. Despite these questions, the good news is the federal government is at least taking some concrete steps to prepare for an outbreak. As U.N. Secretary General Kofi Annan said recently: "We don't know if this will lead to a human pandemic, but we do know what a human pandemic is." Yes, we do. It is estimated up to 50 million people died during the flu pandemic of 1918. With preparation, we can have some hope of avoiding a repeat of that deadly period in world history. To get a border city's perspective on immigration issues, we spent some time recently in Laredo, Texas, a city of around 200,000 people. Residents here are concerned about what they say is a porous border with Mexico and an apparent turf war between drug-running gangs. A key drug-smuggling route into the United States runs right through Laredo. They say a lot of their trouble comes from Nuevo Laredo, a once-popular Mexican tourist town just across the border. This year alone, more than 90 people have been killed in Nuevo Laredo. This includes four Mexican drug agents who were shot dead in broad daylight. A local newspaper was also shot up, an attack newspaper employees interpret as an attempt to muzzle them. Now, law enforcement officials from Webb County, which encompasses Laredo, say they are seeing an increase in violence on their side of the border. Webb County Sheriff Rick Flores says his deputies confiscated $17 million worth of narcotics, more than $1 million in cash, and serious firearms, including an AK-47, last year. But Sheriff Flores says his greatest fear is that terrorist groups will infiltrate the drug cartels, and eventually, smuggle weapons into the United States using the cartels' technology and knowledge. What's the solution to this problem? Sheriff Flores says he needs more men on the ground and better equipment to keep up with the cartels' night vision and GPS technology. "It's impossible to have people every 10 feet in the border. I'm not asking for that. But it's been long overdue that we get the assistance to have more bodies to be more vigilant," Flores said. The U.S. Border Patrol says it recognizes it needs more people on the ground to help local law enforcement. It hopes to do more recruiting to increase its numbers by 9 percent this year. But will that be enough? How concerned do you think we should be about drug cartels crossing our border? And do you really believe terrorists may enter through Mexico? The Sonoran Desert can be blazing hot during the day, but bone-chilling at night, especially this time of year. It's a vast, often forbidding, but spectacular place. We spent a night roaming this area with a group of guys who form the tactical arm of the U.S. Border Patrol, called BORTAC. These guys leave family and loved ones for seven weeks at a time to live out here in the desert. There are three shifts of about ten men apiece. The overnight shift can be the busiest, and sometimes, the toughest. BORTAC agents are given the latest high-tech gadgets and infrared devices to track smugglers, but sometimes old-fashioned legwork and beating the brush ends up working best. Smugglers often cross the border with large groups of illegal immigrants, sometimes 60 or even 80 in number. After crossing, they split up and try to scatter in the desert. BORTAC agents drive along roads near the border searching for footprints and signs that groups of illegal immigrants are on the move. On our trip, I asked Russell Church, the team's leader, how he knows they won't just cross the road after we pass. "We don't," Church said. "We just hope we can pick their tracks up the next time and pass the information on to the other agents farther north so they can flush them out." As a routine part of their jobs, these agents will track illegal immigrants for miles through dense cactus and underbrush loaded with rattlesnakes. On the night I was with them, two agents from the overnight shift continued tracking some potential smugglers through ravines and gullies into the morning. Around 8 a.m., three hours after their shift was over, they rounded-up 24 illegal immigrants with the help of a helicopter -- a small victory for the Border Patrol in what is shaping up to be a very large war. We all know that security has been tightened at U.S. border crossings since 9/11. And that's why we were quite surprised when we found out the tale of one particular crossing on the border with Canada. This official U.S. Customs and Border Protection reporting station is on the border between Manitoba, a Canadian province, and Minnesota, and relies on the honor system. Yes, the U.S. government is counting on all people who cross into Angle Inlet, Minnesota, to report themselves via telephone. There are no permanent customs or immigration officials who work at the checkpoint. Angle Inlet is the northernmost city in the contiguous United States. To get there over land, you have to drive 40 miles within Canada to the other end of the Lake of the Woods, so the Minnesota town is in essence an enclave that sits within Canada. Because of that geographical quirk, and because very few people live up there, the checkpoint has always been laidback. But in this day and age, law enforcement officials in Lake of the Woods County, Minnesota, are very concerned. The sheriff there says he has intelligence that drug smugglers and potential terrorists take advantage of the "honor system" to cross into Angle Inlet illegally and then take a boat across the Lake of the Woods to go into "mainland" Minnesota. The checkpoint looks like a shack. You are supposed to stop your car when you get there, get out, and pick up a videophone that often doesn't work. When we got there, we picked up the phone and pushed a button that has the American flag on it. Nothing happened the first six or seven times I pushed the button. Finally, I heard a Customs employee's voice. She said her name was Officer Johnson, and she cordially told me she was in the Customs office in Warroad, Minnesota, about 50 miles away. She told me to stand in front of the camera so she could see me. Then video of her popped on the screen so I could see her. She asked for my name and my purpose for coming to the United States, and asked me to hold my passport in front of the camera so she could see it. I was then approved for entry into the United States. While we were at the border "shack," other cars just zoomed by; not necessarily because the motorists were up to no good, but because many perceive the shack with the faulty phone to be a cumbersome waste of time. Residents are given special permits to avoid going into the shack, but it's estimated by the local sheriff that 70 percent of the people who are supposed to stop don't bother doing so. So is this border checkpoint going to stay this way? That's what we asked U.S. Customs and Border Protection officials. They told us that this is not considered the "highest risk" area. But officials did tell us some changes are in store. Customs officers do make patrols to the checkpoint. They said those patrols will be increased. In addition, they said there will be technological changes, including the installation of cameras providing surveillance over the area, not just inside the shack. Before we left Angle Inlet, we met one motorist from Manitoba who did his law-abiding duty and picked-up the videophone to report his arrival into the United States. But it would not work for him, so he picked-up an old-fashioned payphone and called the office. They couldn't see him or his passport, but customs officials thanked him for trying, and then let him into the United States. There were a lot of really interesting responses to yesterday's post about the Minutemen building a fence on the U.S.-Mexico border. I'm curious to know what a lot of you think about yesterday's demonstrations as well. When you are standing in the midst of the demonstrations, as I was yesterday in Los Angeles, it's hard to get sense of how the images and messages are playing elsewhere in the country. Do you think they were effective or counterproductive? Many of you probably haven't had the chance to spend much time on our southern border, but it's a fascinating place to visit. When you actually see the border fence (in the places where there is a fence), it's surprisingly small. Also, the countryside is littered with water bottles and clothing left behind by illegal immigrants trying to elude the U.S. Border Patrol. Day and night, night and day, the game of cat and mouse is played out between smugglers and law enforcement. Of course, it is no game, and each year hundreds of lives are lost on the border. Tonight, we want to give you a sense of what life is like along the border for law enforcement, illegal immigrants, and others, so we've put together a special edition of "360°" called "24 Hours on the Border." It starts at 11 p.m. EST, after the first hour of "360°." I hope you are able to watch. "This is a tsunami. This is no small thing. This is an emergency." Those are the words of Jan Egeland, the United Nation's undersecretary for humanitarian affairs. He is referring to the situation in Darfur, a dry, desolate, swathe of land about the size of Texas, tucked neatly into the western part of Sudan. In Darfur, tens of thousands of black Africans have been systematically slaughtered by an Arab militia known as the Janjaweed. Tens of thousands of women and children have been raped and mutilated, while millions more have been forced to flee their homes. The United Nations says the Janjaweed is sponsored by the Sudanese government. Over the weekend, Sudan agreed to accept a peace deal brokered by the African Union, but the Janjaweed and other rebel groups have yet to agree to terms. Someone once called Darfur the land of the three Ds -- death, disease and despair. According to the United Nations, Darfur is the world's worst humanitarian disaster. U.S. officials have another phrase for this slow-building tsunami -- genocide in the 21st century. The poorest of the poor wind up in refugee camps. At last count that number was somewhere around three million people. But this may be for only a short while, as the few aid agencies still able to operate here are attacked regularly by the Janjaweed. "Three million lives are at stake. Three million people need food," says the U.N.'s Egeland. How does one begin to organize to feed three million hungry, angry people? So far this year, a handful of countries have contributed more than $100 million in aid. But the United Nations says it would need five times that amount to prevent millions of people from becoming extinct in plain sight. 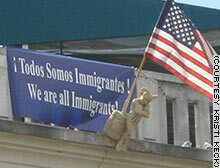 A banner waves from the second story balcony of Top of the Hill, one of the most popular restaurants in Chapel Hill, North Carolina -- "Todos somos Immigrantes! We are all Immigrants." Proprietor Scott Maitland decided to close shop on Monday and forego about $12,000 in sales to support "A Day Without Immigrants," hoping to draw attention to the debate about immigration policy. "Immigrants have always been an important part of our society," Maitland said. "Our willingness to open up makes us American." Maitland said immigrants play an integral role in his restaurant, with many of them working there for more than five years, advancing from the dish room to the floor. Sam Kenworthy, a college freshman, read a notice on the door explaining why the restaurant was closed, but paid more heed to a handwritten addition from his friends telling him to "Go to Spanky's" -- a restaurant across the street. Dozens more would-be patrons also read the notice, pausing for a moment before rattling off other dining options. But it also got some of those people talking. "I think it sends a positive message that boycotts like this work," said Sara Ward. She said the closed restaurant made more of an impression on her than anything she had seen in the news. One thing that really stood out to me after walking around the rally in downtown Los Angeles today -- all the people smiling. Normally, when I go to a political rally where people are protesting something, their faces appear very serious, even angry. Here it's almost like a celebration. I do see some Mexican and Korean flags here and there, but I'd say 90 percent are American. I think the organizers are getting better at playing to their audience in middle-America, because no one is handing out Mexican paraphernalia -- it's all American. The mayor of Los Angeles, along with a lot of other leaders, told students to go to school today, but I see kids everywhere I look. I asked one kid if he came here just to get out of class, but he was pretty serious. He said he was born here, but his parents were not, and it's important to him to join the rally. But I doubt that's the case with all the students who missed school today. We called the Los Angeles school district, and they said about 72,000 students, or more than one quarter of the total number of students in grades 6-12, didn't show up today. In a sea of Hispanic faces at this rally in New York City, there is blond-haired Anna Cwiecek of Holland. "I wanted to live here," she told me. The 21-year-old with a pierced eyebrow said she's been in New York ten months on a student visa studying english. She would like to stay to pursue a degree in international criminal justice. More representative of the crowd are painters and construction and restaurant workers from Mexico, Guatemala and Honduras. They barely speak English, but using my broken Spanish, I can understand as they tell me they took the day off from work because they want to become U.S. citizens. The main immigrant rally at Union Square has attracted perhaps 6,000 people, not quite enough to fill the entire square. In many New York neighborhoods, the day without immigrants did not generate boycotts at all. So it was business as usual in this, the nation's business capital, even here in Union Square, where the regularly scheduled farmer's market had plenty of room for customers. Scott Crosby, an "all natural" muffin and turnover salesman told me, "Sales are good." "Aqui estamos, y no nos vamos!" "We're here, and we're not leaving!" Thousands of people delivered that message during four separate demonstrations held in and around Phoenix, Arizona. More than 1,000 people formed a half-mile-long human chain stretching around the block from the Home Depot store near 75th Avenue and McDowell Road. Two Home Depot stores were targeted for the demonstrations to document the importance of immigrant workers, said Alan Hanson, 30, of Phoenix, a volunteer for the group Somos America (We are America), which organized the chain. "We don't see this as fighting," Hanson said. "We see this as workers exercising their rights in this country." In another demonstration, people chanted and cheered "Si se puede!" -- loosely translated as "Yes, we can" -- in front of Trevor Browne High School in southwest Phoenix, where many students are immigrants. Jesus B. Alvira, 58, of Phoenix, said he came out for the Trevor Browne demonstration because he wants to show that people are sometimes wrongly thought to be illegal immigrants. A seventh-generation Arizonan, Alvira said his family lived in the area before the city even existed. "Just by looking a little dirty and taking off my cap, you'd think I'm illegal," Alvira said. He added that the Latino vote is to be reckoned with when considering immigration reforms, because many Latinos are U.S. citizens and are part of a group with growing political clout. "When November comes, they're really going to put the vote on," Alvira said. The march started out nice and easy from Union Park in Chicago, looking more like one of those mass fundraising walks than a political rally. Spirited chants of "Si, se puede" -- loosely translated as "Yes, we can" -- swelled from the crowd now and again as various groups wearing similar T-shirts or hats walked together. "We also have a dream"
"Your homes need my work for more beautiful"
"Mexicans in Mexico should organize like Mexicans in US"
The smiling women of St. Patrick's Old Church handed out cups of water to the marchers. Marching alongside women in head scarves, Rami Nashashibi, executive director of the Chicago-based Inner-city Muslim Action Network, said his group brought 40 members to "stand up for Latino brothers and sisters." Workers from the Chicago Housing Authority watched the marchers go by from their office, with a sign saying "We Support You" hanging in their window. Boyd Klingler, a financial services worker in a suit, watched the marchers from behind a police barricade. Asked what he thought, he gave a wry smile and said, "That there are a lot more Mexicans in Chicago than we thought." At Lou Mitchell's, a longtime Chicago lunch spot, two regulars discussed the issues as the marchers walked by. "People aren't doing what they should be doing," said Gary Williams, referring to a story he read about local police who knew illegal workers were in their town but did nothing. "I see both sides," said Dennis Mogan, adding that there must be some sort of middle ground to solve the problem. As marchers entered the Loop, a motley band of anarchists made a racket beating on street signs and bucket drums with their "No Borders" and "viva Anarchia" message. Most marchers didn't seem to know what to make of them and followed cautiously at a distance. After waiting for hours in front of a nearly empty city hall in Los Angeles, the crowds arrived en masse shortly after 11 a.m. local time. While there's no official crowd estimate, the line for the porta potties is beyond long, so we obviously have a big protest on our hands. Before it got crowded here, I got to talk to Cecilia Mendez, a grandmother originally from Mexico. She came to this Los Angeles rally before it got moving, because her husband has a foot injury and can't walk the protest route. We chatted together on the steps of city hall as we waited for the crowds. She's been a legal resident since 1985 and gave birth to two daughters in the United States. Cecilia joined the rally because she wants people to come out of hiding. She thinks illegal immigrants who have been here working and contributing to society deserve a chance to live with the same rights as everyone else. Cecilia came wearing white and waving an American flag. She said she hadn't protested since the days of Cesar Chavez, a Mexican-American labor activist and former leader of the United Farm Workers. Just like any grandmother might, she shook her head at some of the younger protesters. In particular, she couldn't understand why someone would bring a Mexican flag to a rally in the United States. As she put it: "I love this country. THIS is where we want to live ... to work." The Mall in Washington, D.C., has been site of many memorable, massive protests, with demonstrators making their points heard in view of Capitol Hill. By the middle of the day, a few dozen pro-immigrant AFL-CIO-affiliated protesters from Wayne County, North Carolina, and a handful of others reading from the Bible were on the Capitol lawn. Local labor and other civic leaders made a conscious decision not to act -- for now, at least -- even as elsewhere crowds marked "A Day Without Immigrants." As with much in Washington, politics played a prominent role. "The ball is now in the Senate's court -- they deserve time to address the issue," said Jaime Contreras, president of the National Capital Immigration Coalition, which organized an earlier protest. "We're trying to hold back. There are other things we can do." While speaking 142 languages, Washington's immigrant population isn't as established as those in cities like Los Angeles and New York. But it's growing rapidly in size (from 400,000 in 1990 to over 1 million) and stature, according to Gustavo Torres, head of CASA de Maryland, a non-profit group that offers services to area day laborers. Protests by immigrants may yet return to the streets of the nation's capital at some future time. But for today, apart from smaller gatherings around the region, such as at Washington, D.C.'s Malcolm X Park, big protests are the province of other cities. As a massive crowd started to gather in Chicago, I went hunting for a live interview with someone who was taking part in this city's immigration rights march. Instead of finding one person, I found two -- two guys who didn't know each other until this morning. Jose Garcia and Luiz Ramirez were standing behind a large banner and talking to each other about what they believe. Jose, a retired high school teacher from Chicago's suburbs, came to the United States from Cuba when he was 15 years old. Luiz, a junior high school teacher who took the day off from work, emigrated from Guatemala almost 20 years ago. Both are U.S. citizens. "It's a moral issue," Luiz said, explaining that he's marching because he believes immigrants are vital to the American economy. He thinks undocumented workers should not be thought of as lawbreakers, but as contributing members of society who are worthy of citizenship. I asked, "Why now? What is it that is causing such an intense reaction in Chicago's Hispanic community?" After all, the quickly organized March 10th rally drew an estimated 100,000 people, and today's rally has been projected to be at least twice as large. "It's that House bill," said Jose, referring to legislation in the U.S. House of Representatives that would make illegal presence in the United States a felony, as opposed to a civil offense. "That is an insult," Jose added. "That got a lot of people to come out." Indeed, the scene before me is something of a coming out party. People who have spent little time on politics are now marching and expressing their beliefs, and in the case of Jose and Luiz, making friends. The two strangers found they were both teachers, both graduates of the University of Illinois at Chicago. They plan to march together, sharing food from Luiz's stuffed backpack. They hope that those marchers who are illegal immigrants may someday become American citizens, just as they did. I spent this past weekend along the U.S.-Mexico border. Friday night, I went out with U.S. Border Patrol agents searching for illegal immigrants. Then, Saturday morning, I met up with a large group of Minutemen volunteers who planned to build a fence along a remote patch of border. If you have been following the border debate, you no doubt know about the Minutemen. They are volunteers who patrol the border, hoping to deter and detect illegal immigrants. They don't try to apprehend border crossers themselves; they watch them cross and call the Border Patrol. Their critics call them vigilantes. They respond by saying they are vigilant. I didn't really know what to expect when I went to meet the Minutemen. At 8 a.m. Saturday, about a hundred volunteers gathered in a trailer park near the border. They set out in a convoy of trucks and SUVs to a remote section of the border where they began to build a barbed-wire fence. There is a fence along parts of the border, but it stops from time to time. So the Minutemen began drilling holes for posts and stringing barbed wire. They didn't know if they would be stopped by the Border Patrol, but the atmosphere was festive. Those unable to actually work on the fence cooked hot dogs and served sodas in the desert heat. For many, it was the first time they'd volunteered for the Minutemen, and they seemed happy to be doing something. I asked one woman why she was there, and she said this is one issue where she actually feels she can make a difference. She said she couldn't do anything about the deficit or gas prices, but she could stand on the border and "be the eyes and ears" helping the border patrol. There is a lot of debate about the effectiveness of building a fence along the border, and the Minutemen constructing the fence on Saturday admit what they were doing was largely symbolic. But it was a start, they say. I think the imagery of American citizens standing on the border and building a fence with their own hands is pretty powerful, and I think this may be a new front in the battle on the border. I'd be interested to know what you think. Should Americans take matters into their own hands and build fences along stretches of the border that don't have any fences? The land they were doing this on was owned by the federal government. Even if the fence is barbed-wire and doesn't really deter people from crossing, is it worth building to send a message to our leaders? Would you help to build a section of fence along the border? Tonight on "360," we'll have more on the Minutemen's fence building operation. About 2,000 people gathered in front of the Georgia State Capitol as the noon kickoff time approached for a planned rally to mark "A Day Without Immigrants." People were trickling from downtown Atlanta to the site, but it seemed unlikely there would be the tens of thousands seen at an April protest in the Atlanta area. While the numbers may not have been high, opinions were strong. Heather Ruark, 29, sat on the sidewalk and wrote out a protest sign. The Dekalb County teacher said she was waiting for her husband, an illegal immigrant who would soon be heading back to Mexico to fight for legal status from beyond U.S. borders. Ruark said she would be joining her husband in Mexico. Marco Obregon of Mableton, Georgia, came with his wife, Flor, and 8-year-old daughter Kenya. Obregon owns his own construction business, employing six people. He said he came to show "support for our brothers." As Obregon spoke, across the street was Michael Mooney, a 40-year-old chemical plant worker from Cartersville, Georgia. Mooney held up a sign supporting strong immigration laws, and said those who want to come to the United States should "be patient, follow the laws, and wait their turn." People need to earn their way into the country, he said. As his employees stir giant vats of dough, Richard Eng, manager of the Canton Noodle Corporation, tells me that he and his employees are too busy to step out and join the human chain planned down the block just after noon today. "We have too many noodle orders," he says. This company on Mott Street in New York City supplies lo mein and wontons to local restaurants -- all of which are open today. Across the street at the Grand Harmony Restaurant, the geese and duck are roasting. It's business as usual, with management expecting a large lunchtime and dinner crowd. Of the several dozen people I've spoken to on the street today, none of them are boycotting work. Many people are simply unaware of the demonstrations planned as part of "A Day Without Immigrants." Organizers say they're expecting between 600 and 700 people to link up as part of the human chain that is to span down New York's Canal Street and East Broadway. El Diario, the city's top Spanish newspaper, has a front page that is half-blank, in order to symbolize the day without immigrants. This day may be a significant event in the Latino community, but here in Chinatown, where nearly everyone is either an immigrant or a child or grandchild of an immigrant, it is business as usual.